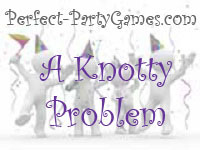 Summary: A Knotty Problem is a game for folks who like to unravel knotty problems - and whose patience is rewarded with a charming new acquaintance at the end. Lengths of string, like nylon cord. Thin string, like yarn, tends to tangle, so stay away from it. You will need half as many pieces of string as you have players. So for a ten-person party, you will need five lengths of string. Experiment in your space with a 40-foot string and see if you want to go longer or shorter. Thread each piece of string through your living room (or entire home, or your yard, if you want to go big) looping through things, under things, and over things. Create a sort of obstacle course for each couple. But both ends of the string must be at the front door. Once all your guests arrive, distribute one string-end per player. Each player must then crawl, climb, and burrow through the space, untangling, untwisting and unknotting as he goes, until he meets up with the person untangling from the other end. The couple to find each other first wins, though the game continues until all couples have completed the task. Players who have finished should help the other players find their partners - by this point many other strings may also be knotted together anyway and it may require a group effort to find each other.